Christmas has always been my favorite holiday. Have you begun creating a holiday shopping list of gifts you need to purchase? Instead of buying all your gifts this year, why not try winning some! 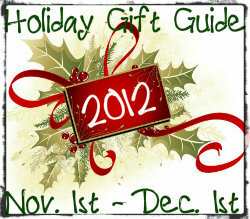 Beginning November 1st, I will be hosting a Holiday Gift Guide 2012 and Giveaway Event! Being Frugal and Making it Work will be showcasing a variety of fantastic products for the entire family that will make the perfect gift this holiday season! There are going to be some pretty amazing giveaways lined up for this holiday event!! You definitely don’t want to miss it. If you would like to have your item or company featured, please feel free to contact me. I'm also looking for guest posts that fit into the gift giving and holiday theme! I have shipped a lot of gifts off already, but I am looking for a little gift inspiration. I'm sure you will have lots of great gift ideas, thanks for hosting the holiday gift guide.